During L&T Technology Services’ well-attended interactive workshop, “Benchmark Your Digital Enterprise,” at the 2017 ARC Industry Forum in Orlando, Florida, we polled workshop participants with a series of questions. Executives from L&T Technology Services and ARC Advisory Group then discussed each question. Cumulatively, the workshop provided valuable insights on the current adoption of smart technologies and the Industrial Internet of Things (IIoT) in manufacturing. As we learned, equipment OEMs and end users alike have begun to apply IIoT-enabled solutions to avoid unplanned downtime for critical equipment and the available technology has started moving into optimizing manufacturing operations. During the workshop, questions were posed to the audience, and the polling software captured the responses in real time for all to see. Based on the responses from those attending the workshop, most are just getting started, with 58 percent in the discussion and strategy development stage. This portion of the audience has not yet started an implementation. In addition, 23 percent have pilot projects and expect to be able to validate the technology and its potential business benefits. Clearly, with 81 percent either evaluating or in the pilot stage, technologies for industrial IoT have entered a dynamic phase. ARC has written many case stories for IIoT with proven return on investment (ROI), and we expect to see rapid adoption among industrial companies to improve asset performance management (APM). Question: Level of adoption of digital/smart technologies in manufacturing processes? Another insightful response from the audience shed light on challenges of adopting smart technologies like IIoT such as security, privacy, and business case (ROI). However, as we learned, the biggest challenge involves internal culture and associated resistance to change. Managers should be aware of the basics of change management to successfully break through an organization’s natural tendency to resist change. This starts with communicating a sense of urgency (what is the threat? ), and then “what’s in it for me?” from the individual employee’s perspective. 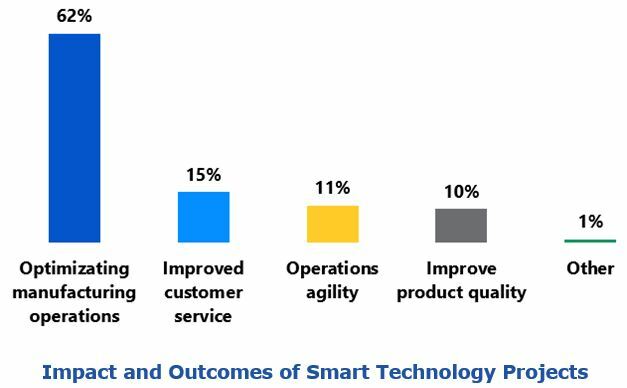 Question: For your manufacturing processes, rank the challenges towards adoption of smart technologies & defining ROI. The attendees were asked to categorize the outcomes achieved by their IIoT projects. Optimizing manufacturing operations clearly provides the dominant area of benefit. IIoT software platforms are now available from major suppliers like ABB, Bosch, GE, Honeywell, IBM, IFS, Microsoft, Oracle, PTC, Rockwell Automation, SAP, Schneider Electric, and Siemens. These companies and many smaller ones have successful case stories in a broad range of industries. The clear majority of these case stories involve predictive maintenance (PdM) to prevent unplanned downtime which impacts revenue and safety. Industrial applications are starting to move beyond PdM to include supply chain, process optimization, and other domains. Before IoT, PdM and other industrial applications usually involved engineering projects using custom software layered on the process control system with proprietary APIs or communicating machine-to-machine (M2M) via telephone lines. These applications were often expensive, with high risk of less-than-successful implementation because of the extensive custom engineering required. IIoT now has established platforms and solutions that lower implementation cost, time, and risk. These can reduce total project costs by an order of magnitude or more. The old approach involving custom software and integration with other applications was brittle; if a software application had an upgrade, the application typically failed. Since the original project team disbanded, resources would no longer be readily available to fix the problem. A new team would have to learn the application, architecture, and code. Rather than make this substantial investment, the software would often be abandoned. Applications developed on an IIoT cloud platform minimize the need for the corresponding custom software for the associated underlying infrastructure. Using a platform reduces support requirements, leading to a more sustainable solution. With established platforms, IIoT solutions “break” less often and, if broken, can be more easily fixed because one does not need to re-learn the software – just the APIs. For 300 expensive CNC machines, an IIoT solution helped improve uptime with data acquisition, analysis with root-cause diagnostics, and predictive maintenance. For 3,000 MIG welding machines in multiple locations, an IIoT solution helped improve mean-time-to-repair (MTTR) by examining spare parts availability and logistics and incorporating predictive maintenance. In power transmission, IIoT-enabled predictive maintenance reduced downtime and cost of maintenance by monitoring the health of large transformers. This included analyzing oil sampling test results, transformer winding temperatures, oil temperatures, loading, and maintenance logs. An IIoT-enabled energy monitoring and management solution involving water, air, gas, electricity and steam (WAGES) consumption, monitored conditions with dashboards, provided visibility to compare plants, and helped benchmark best practices. The company achieved energy savings of $6.9 million per year across its fleet of 28 plants. An intelligent building solution for energy management included HVAC, lighting, electrical, meters, elevator, water pumps, UPS, access control, and fire panel. The company reduced energy consumption without compromising human comfort and productivity. Combining IoT-enabled remote monitoring for personnel protective equipment with sensors, analytics and cloud to improve safety and avoid incidents. IIoT technology is being applied today to a wide array of industries and systems. Most industrial organizations first find the “low hanging fruit” with predictive maintenance and start there. Nearly all end users have a problematic critical piece of equipment for which unplanned downtime negatively impacts production and the associated revenue – which quickly gets management attention. A win here could quickly turn skeptics into believers. A project focused on one machine or similar machines limits scope to minimize project risk and improve time to benefit. After initial successes with PdM, the organization gains skills and confidence to move onto more complex IIoT projects. Gains can be achieved in broader operational performance across the multiple independent units, work centers, and/or systems that exist in every industrial company. For example, by using IIoT to track the exact location of critical and expensive materials to improve visibility, coordination and throughput; companies can lower work-in-process material requirements and increase capacity, both which improve the balance sheet and P&L statement and gain positive executive attention. Ralph has 40+ years experience with manufacturing and industrial applications. Ralph has been with ARC Advisory Group since 2000. Before joining ARC, his roles include marketing and product management for suppliers, as well as engineering-in-manufacturing functions for end-users. Ralph was with General Electric, Intellution/Emerson, Digital Equipment Corp., Motorola, and Texas Instruments. Ralph holds a B.S. in Mechanical Engineering and an M.S. in Management Science from Rensselaer Polytechnic Institute, Troy, NY.